Individuals with small assets who are seeking estate planning options usually have a false misconception that estate planning is not for them. However, this way of thinking is flawed. On the contrary, estate planning is a wise decision no matter the size of the estate or the dollar amount associated with it. Individuals with varying levels of income are wise to create an estate plan. In fact, people may find that it is more costly to die without an estate plan in place. There are many estate options that will facilitate ease of asset distribution and ensure that your family has peace of mind. A will is a document that provides instructions for managing a testator’s (the person who is the author of the will) estate. A will is the most basic tool that documents a testator’s wishes for how property should be transferred after their passing. To be viewed as valid, the will must be in writing, signed and attested. The value of the assets in the will is not important; that is why anyone no matter their financial position can write a will. The transfer of property is not limited to large sums of money. Anything that is said to be legally transferable can pass in a will. This includes the transfer of personal property and effects, real estate, and trusts. There are a few types of assets that cannot pass by will. These are Paid on Death accounts, life insurance policies, property held in joint tenancy with right of survivorship, and joint bank accounts with proceeds going to the surviving joint holder. A testator is well served to write a will, but they should also seek legal advice to determine what can and cannot go in the will to ensure the will works for them in an optimal manner. A Power of Attorney is a legally binding agreement between two parties called the principal and the attorney in fact. The attorney in fact is not an attorney at law. The power of attorney gives the attorney in fact legal rights to act in the place of the principal. To that effect, attorneys in fact act as fiduciaries to their principal, which means the attorney in fact will acts with the utmost care when dealing with the principal’s affairs. The agreement usually directs the attorney in fact to make financial decisions on behalf of the principal. Powers of attorney are usually seen between married couples where the agreement states that one spouse will take over the affairs of the other should one spouse become incapacitated or otherwise ill. Powers of attorney are also common between aging parents and their adult children. No matter the size of your estate, you should consider a power of attorney. This is especially true for people of advanced age. Similar to a power of attorney, a medical directive is a legal document that takes effect when one cannot make decisions as a result of illness or incapacity. Medical directives, as the name reveals, are centered on medical treatment decisions. It is important to note that there are different types of medical directives, which can be tailored toward the individual needs of the ailing person. Some medical directives instruct on which medical measures are permitted to prolong life. Other directives simply name a surrogate to answer medical questions. 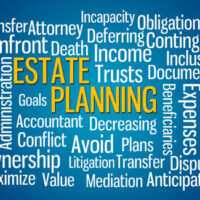 We provide legal assistance to individuals who wish to explore estate planning options. The Office of Law E. Bray has years of experience in estate planning law and will tailor advice based on your unique circumstances. Call the Law Offices of Larry E. Bray, P.A. in West Palm Beach to determine the options that best fits your estate planning needs.